It would figure of course that I say nothing is happening and now we get a couple of more signings and trades in baseball. The Anaheim Angels have signed Brian Fuentes to a 2 yr 17.5 million deal with a 9 million option for the third year. The Cleveland Indians traded 3 prospects to the Cubs for Mark DeRosa. The Baltimore Orioles signed Mark Hendrickson to a 1 yr 1.5 million dollar deal. As we close out 08 and look forward to 09 lets reflect a little. We did say goodbye to the Cathedral known as Yankee Stadium as well as every Yankees fans friend Bobby Murcer. We saw the Yankees miss the playoffs for the first time in 13 yrs. The Yankees had Joba hit with a DUI in the offseason. The new year will bring new players and lots of hope, this should be a great year for the Yankees and all involved. We can look forward to CC,AJ,Tex and Joe Girardi being a different person perhaps. We can look at a palace called Yankee Stadium and dream of all the memories this version of the Old Cathedral will bring. We can see the Yankees back to where they belong in and winning the World Series. Lets all look forward to a wonderful 2009. 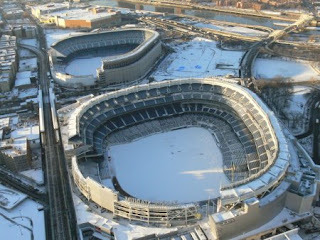 I will be talking about the new stadium in a guest blog on yankees.lhblogs.com for Peter Abraham of the Journal news on January 21st, all please check out my work, thank you for reading and have a wonderful new years. There is not too much going on in Baseball since they shut down the sport from Christmas Day through New Years Day. The Boston Red Sox signed Brad Penny. The one Major thing that is going on in Baseball is MLB network goes on the Air starting tomorrow at 6:00PM. They will have a hot stove show followed by Don Larsens 1956 World Series Perfect game. The game will be shown with the original commercials and all, its a must see for all Yankees fans. I have been watching the preview of this network for a couple of weeks and it looks great. Our National Pastime goes full time starting tomorrow, it will be a great way to get all baseball info at anytime. I did hear yesterday that the Mets offered Derek Lowe a 3 yr 36million dollar contract, good for them, i think they should get Manny also. I hope the Sox dont get lowe and end up with nobody other then Tazawa the Japanese pitcher who may have no impact this year anyway. Happy New Years everyone and remember tomorrow our National Pastime goes Full Time. The playoff matchups have been set. The Atlanta Falcons will visit the Arizona Cardinals at 4:30pm on Saturday. The Cards are 3 point favorites,they finished the year terribly but im not sure if thats just because it didn't matter to them or are they really not that good. The Indianapolis Colts will visit the San Diego Chargers at 8:00PM on Saturday. This to me is a very fascinating game, no one thought the Chargers would make it and they did, and we all know they are better then an 8-8 team. The Colts are just rolling, winning 9 in a row and Peyton Manning definitely being the MVP of the league. I really think who ever wins this game can be a very dangerous team to the higher seeded teams. The Baltimore Ravens visit the Miami Dolphins at 1:00PM on Sunday. I think Miami had an unbelievable year but I think the Ravens will win this game. I am sure Jets fans will be happy, but they did have an incredible year no matter how this one turns out, good job Chad Pennington. The Philadelphia Eagles visit the Minnesota Vikings on Sunday at 4:30PM. The Eagles who at the beginning of Sunday had basically no shot of making the playoffs, found themselves in at the end of the day. They have played great football down the stretch and coming out of the NFC East are very dangerous. I look for the Eagles to win this game and if they play the Giants may have the best chance of upsetting them. The rest of the playoff schedule is Saturday Jan 10th someone at the Titans at 4:30PM and someone at the Panthers at 8:15PM. Sunday Jan 11th someone will be at the Giants at 1:00PM and someone at the Steelers 4:45PM. The Conference Championships will be Sunday January 18 at 3:00PM for the NFC and 6:30PM for the AFC. The Super Bowl is Sunday Feb 1st in Tampa at 6:00PM. This should be fun, the playoffs. I am most interested in the Colts/Chargers,Eagles/Vikings and then it should get fun in the second round and on. Lets Go Giants, Back To Back Super Bowls is what we want, sorry to all the Jets fans, you will have your day eventually though, not sure if you will be around to see it though. I apologize for the lack of posting, i have a lot of catching up to do. The reason i haven't been posting is that i have been at the hospital with my wife. We had a beautiful baby girl at 9:54am today,8.1oz,21inches long. Her name is Alexandra Brooke Marchese,she now joins the Yankees family as she will be heavily invested in them, thanks to her daddy. I hope to post some pics soon, and update the blog in the coming days. Thanks for your patience and understanding and for reading this blog. Major League Catchers-Jorge Posada is penciled in as the starting catcher at this point. He is progressing well with his rehab and is expected to be just fine, we will see when spring training starts how realistic that is. The Yankees have a great backup in Jose Molina. He did an outstanding job filling in last yr but they just cant replace Jorge Posada's offense. AAA Catchers-The Yankees just signed former Boston backup Kevin Cash to a minor league deal for insurance. He will be the AAA starting catcher. The Yankees also have highly touted Francisco Cervelli slated as the backup here. He is the catcher who got run over last yr in spring training and broke his wrist. He is a very good defensive catcher but no one is sure yet how he will do offensively. He did show some promise when he got back last yr in the last month. AA Catchers-PJ Piliterre should be the starter again this year. The pitchers have talked him up as a very good reciever. He isn't really much of a hitter at all though and I dont know how much of a prospect he is with guys in the lower levels projected ahead of him as well as Cervelli. Kyle Anson should be the backup here. He is an intriguing bat, he had a 367 on base percentage last yr in Single A Tampa. Others To Watch-Austin Romine and Jesus Montero are the two most highly touted catchers in the system. They are both going to start the yr in single A but dont be suprised if at least one if not both end up in AA at some point. Montero has a big bat and most expect him to switch positions at some point due to his size. With Mark Teixera the 1st baseman for the next 8 yrs it takes that position away so maybe he will just stay as a catcher. He has improved alot his defensive skills and it will be interesting to see how he does this yr especially if he gets bumped up to AA. He hit 326 with 17 hrs and 87 rbi last yr. He also had a 376 on base percentage. Romine is considered a good offensive catcher himself, he hit 300 with 10HR and 49Rbi this past yr. He also had a 344 on base percentage. I will start with the local teams in this last weekend of the NFL regular season. The New York Jets play at home against the Miami Dolphins and their jilted ex QB Chad Pennington. The Jets have to win and then hope either the Patriots or Ravens lose and they will get in. If Miami wins they win the AFC East and the Jets go home, the Patriots then can get in with a win and a Ravens loss. I dont know what to think of this game, i expect the Jets to play hard and think they can win this game at home, but with them who knows. I expect a tight game maybe 20-17 or somewhere in that range. New York Giants VS Minnesota Vikings-This is a game where Minnesota wins and their in and the Giants have nothing to play for. We do know already Aaron Ross is out with a concussion and expect Jacobs to also sit, I think Boss may also sit and expect Eli Manning to come out early and see the first extended action of the season for backup David Carr. I dont know what Justin Tuck will do but I expect if he plays he will see limited action. If Minnesota loses and Chicago wins then the Bears are in, if Minnesota wins then they are in. New England Patriots VS Buffalo Bills-I dont think the Patriots will have a blowout like they did last week, but I expect them to win by 7-10 points. I am sure they will be ready for this game and hope to have a chance to get into the playoffs with a Jets loss and Ravens loss. I am sure the Bills will play hard but our looking forward to the offseason at this point. Dallas Cowboys VS Philadelphia Eagles-This should be a heavyweight fight, even though the Eagles have basically no chance of making it they would like nothing more then to knock the Cowboys out of the playoffs. I think the Eagles may prevail in a very tight contest. The Cowboys win and they are in the playoffs otherwise they lose and they will be out. Denver Broncos VS San Diego Chargers-This game is simple whoever wins is in and whoever loses is out, these are 2 7-8 teams. The San Diego Chargers are heavy favorites and I think they will probably win by 10-14 points. They are much better then their record shows and could be tough if they do make the playoffs. This should be a great game on Sunday night to finish what im sure will be a wild day. The other games matter for seeding if Carolina wins they will be the 2 seed if not they can slip all the way to 5. If minnesota wins they have a chance for the 2 seed. Atlanta is still fighting for the 2 seed also if they win and carolina loses and Minnesota. I will be breaking down all the games and the Playoff matchups tomorrow night or more likely monday when all is said and done. Baseball is pretty much shutdown now until after New Years but the San Francisco Giants did come to terms with Randy Johnson. The Big left hander will get 8 million for one year and a chance to get 5 million in bonuses by reaching certain incentives. He has 295 wins for his career. This gives the Giants an intriguing rotation with Lincecum,Johnson and Zito all cy young award winners and Matt Cain a promising young arm. He will be back home in the area he grew up in and should get his 5 wins and then call it a career after the year is over. The story has been going around, first reported by the New York Post and Newsday. It is also now on Peter Abrahams lohud yankees blog. It looks like the yankees are prepared to move on without Petitte even though they haven't pulled the 1 yr 10million offer yet. My question is whats up with Andy, why was he waiting so long to accept or reject the offer? I mean 10million for a 4th starter is a lot of money, and why not jump on it to be in the new stadium like he said he wanted, no matter how you look at it, if he goes anywhere else he will not be viewed the same anymore, the Yanks stuck by him last year through the HGH fiasco and he really owes it to them. The Yankees can just use Phil Hughes, Ian Kennedy or Alfredo Aceves for that spot in the rotation or maybe make a trade for another guy. The Yankees with the signing of Tex do look like they may move one or two out of the group of Swisher,Nady,Melky,Matsui. I dont think they will trade Damon because he is a good leadoff guy and in the last yr of his contract anyway and also was a big factor in CC and AJ signing, did a great job recruiting. I think Matsui could have suitors in Anaheim or San Francisco. Lots of teams would take Nady, he is a solid player and is only 29. Melky I think would have to be packaged with maybe Kennedy if you want to trade him. I know Atlanta was interested in Swisher before the Yankees aquired him. It will be interesting to see what the Yanks do, or they can just keep them all and have better depth this year. 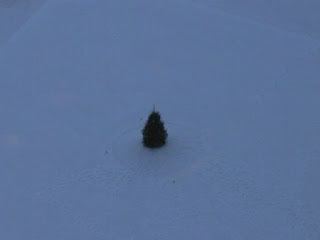 Merry Xmas and Happy Holidays to all. I dont think i will be blogging much more today or tomorrow if at all. Everyone have a very happy and safe holiday. Check out a good yankee poem on yankees.lhblogs.com. It is very funny. The Yankees did make another move yesterday that didn't really get any press. They acquired backup catcher Kevin Cash. They signed him to a 700,000 minor league deal, he will take the role of Chad Moeller last year as insurance in case Jorge gets hurt or Molina. It is interesting that they took him from Boston as Boston right now has no catcher with Varitek a free agent and no one else there. Here he is Big Tex our new first baseman. You got to love the 23, my number and his old number. It is also his idol Don Mattinglys number, He wont wear that number with the Yanks, i wonder what number he will wear? I cant wait to see him hitting it all over the new stadium. Here are some photos of the New Stadium. Looks like a long way from spring but with what the Yanks have done can't wait until then. Everyone check out the article by Lee Jenkins on Si.com. It is a good article about how Tex should fit right in with the yankees. I hope to know when the physical and press conference will be but im sure we wont find out to after the holidays. The question now is do the yankees make any trades do they say bye to Petitte, what next? As a Yankees fan this is the guy i wanted. Since the beginning of last year I had said just get Tex and CC next year and everything will be fine. I was against getting Santana for this very reason, now they got the guys and oh yeah AJ also and kept the farm system intact. The Yankees are back to being the Yankees and everything seems alright in the world even though it isn't. Joe Girardi will have enourmous pressure on him this year but im sure he wont mind. The Yankees now have arguably the best rotation, the best bullpen and the best infield in baseball. The Yankees have said enough is enough and you know what good for them. They have a lot of money off of the books and a new stadium and they put the money back into the team to try and win that elusive 27th title and more. As a yankees fan you have to love this, I personally love everyone ripping us for spending the money then what happened last year where they rip us for not making it and not spending money. I say bring on all the criticism, bring it on, if we win titles I dont care what anyone says. The New York Yankees deserve to do this,they are the model franchise in all of sports and maybe all businesses because they seem to be the only ones making any money these days. Welcome back yankees welcome back and have fun Yankee Haters it should be a fun year. 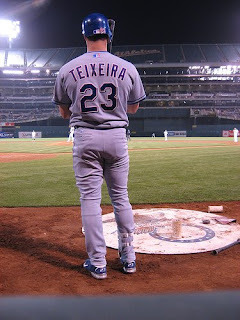 The New York Yankees have agreed in principle to a 8yr 180 million dollar deal with first baseman Mark Teixera or as I will be calling him Big Tex. The deal is pending a physical and wont be official until then. I will be back later with reaction. The New York Yankees have announced today that they have agreed to a 1 yr 5 million dollar deal with Ching Ming Wang. This deals avoids arbitration for Wang and the Yankees, which is never a fun thing to go through. According to Peter Abraham of the Journal News and yankees.lhblogs.com Wang is pleased with this deal. It was a deal that was indicative of what Wang has done according to his agent and he is pleased. Wang will return to the US in 3 weeks, he will be in Arizona working with a trainer. His foot is completely healed but to play it safe he is doing his conditioning on a bike instead of running. The only arbitration eligible players left for the Yanks are Brian Bruney, Xavier Nady and Melky Cabrera. The AAA Scranton Wilkes Barre Yankees and the AA Trenton Thunder have announced the coaching staffs for the 2009 season. Dave Miley will return as the Manager and Butch Wynegar as the Hitting coach. Scott Aldred is moving up from Trenton to take over as Pitching coach. Aaron Ledesma is the new infield coach replacing Alvaro Espinosa. Dave Miley has led Scranton to the best record in the international league the last 2 seasons and a title last year. Tony Franklin will be back in his 3rd season as Trenton Manager, he will have some new coaches Tommy Phelps as pitching coach and Frank Menechino as hitting coach, most of us im sure remember him from Oakland and Toronto. Vic Valencia will be a coach, Trenton is coming off back to back championships their first ever titles. Other News: Chris Britton has signed with the San Diego Padres and Andy Phillips with the Pittsburgh Pirates. I wish them both well,poor Britton never really had a shot with the Yankees, I think Girardi has a thing against fat people and Andy Philips, I never thought they should have gotten rid of. The New York Jets once again came up very small in a game they should of won. The Jets have made a habit of losing and being outplayed this year by inferior opponents. The Jets have lost to San Francisco,Oakland,Denver,Seattle all this year. You have to begin to question the coach and if you are going to keep the head coach you have to change his staff for sure. Eric Mangini just has the same expression and has looked lost all year. There is no excuse for what has gone on with the Jets this year, they can still make the playoffs but it will take a virtual miracle for them to win and Baltimore and New England to lose. The World Champion New York Giants are a different story. They were locked in a amazing battle for the number 1 seed in the NFC last night and came away with a hard fought OT victory. The Giants went back to playing Giants football which is run it down their throats and see if anyone can stop them, they did struggle defensively in the first half but made the adjustments and held them to 7 points in the second half completely taking away Steve Smith. I think the Giants will play better defensively but Justin Tuck was clearly very sick, even caught barfing on the sidelines and without him being affective they can't get a pass rush. The bottom line is they won the only game they had to win all year and now the road to the Super Bowl will come through the swamp in New Jersey. The Dallas Cowboys interestingly enough are still alive and if they win will be in the playoffs but im not so sure they will beat Philly on the road. I think that it will be very difficult to beat a rested Giants team in the meadowlands and I think once again they are the favorites to win it all. I dont know if anyone has noticed but the Colts are hot and have won 8 in a row and Peyton Manning is clearly the MVP of the league again. Wouldn't it be great to get a Manning Bowl? The Anaheim Angels announced today that they have dropped out of the Texiera Sweepstakes. Now that Boston and Anaheim are out, the Yankees could make their move and land him this week before Xmas. This is going to get interesting because it looks like teams aren't fooling around with Agent Scott Boras anymore. I dont know if the Sox are really out but this could be very good for the Yankees if they make a quick strike and steal him. I really hope they get him as you all know, they would have really won the Hot Stove if they do land him and would seem to have a very superior team on paper to get back to the World Series finally but of course you dont play the games on paper. It all comes down to tonight for the Giants and Panthers. This is for the 1 seed in the NFC, I expect a hard fought battle but expect to see a different Giants team then we have seen the last 2 weeks. It will be interesting to see how the weather is tonight, although right now the sun is out and it looks good. The Jets have to beat Seattle to keep their hopes alive. They got lucky last week and haven't been playing well at all but they need to come out and just beat them like they should. The Patriots are routing the Cardinals in snowy foxboro. If the Giants win tonight they can rest up next week and then enjoy watching the first round of the playoffs in the comfort of their own family rooms. I should of been on this earlier but Bernie is going to join a team in the Puerto Rico Winter League next week. He hopes to make the Puerto Rico team and play in the WBC. If I was the Yankees I think i would see how he does and offer him a 1 million 1 yr contract and see what he can do and then he can also train Gardner. I would save the money on Cameron and use it towards Texiera. Mark Texiera by the way has now recieved an offer from the Angels for 8 yrs and believed to be at least 150 million. If the Yanks are not going to get him then I just hope he doesn't end up in Beantown. If I was the Yanks i would still spend the money and get him but lets see what happens. Lets all root for Bernie Williams, i will enjoy watching him play in the WBC if he makes it. The Yankees have decided to non tender Chris Britton and Justin Christian. They had to do this to get the 40 man roster down to 38 so they can add CC and AJ. The Yankees will have to do this again if they sign anyone else. By the way what is taking Andy so long, i mean if he wants to come back then just do it already. In a interesting little tidbit, the Mets traded Scott Showenweis to Arizona for Conner Robertson who is the Brother of Yankee Dave Robertson. If they both make the team they can share an apartment in the city, very neat story-have to root for them. Yanks add another one who's next? The Yankees and AJ Burnett have agreed to a 5 yr deal worth 82.5 million. The Yankees now have CC,AJ,Wang,Joba and hopefully Petitte will come back and be the 5th starter otherwise they may be moving on to somewhere else. I know everyone is worried about AJ staying healthy and that is a legit concern but my question to you is this, are the Yankees better with CC and AJ then they were with Ponson and Rasner? I think we all know the answer to that. AJ Burnett cant beat us anymore so thats a plus and he always beats the Red Sux so thats another plus and when he is healthy he is a dominant pitcher. He may get hurt but he will give us innings unlike Pavano. Joba as a 4th starter, that is scary. The Yankees also have a great bullpen. They may not get Manny or Tex now although i wouldn't be suprised. If they dont though, this reminds me of the old Yanks, Pitching,D and find a way to score some runs with little ball. I dont know if everyone knows about the Rule 5 draft, but that was held today in Vegas at the winter meetings. Anyone that was left unprotected meaning not on the 40 man roster can be chosen. The Yankees did not make any picks and they lost 6 picks today, the most of any major league team. It looks like the Yankees system is pretty good after all. The guys that were chosen were Reegie Corona who played for the AA Trenton Thunder,Zach Kroenke who played with them also,Jason Jones who also played for Trenton,Ivan Nova who played for the A Tampa Yankees. They also lost Andres Santos and Josue Selenes in the minor league portion of the draft. I dont know anything about the last two picks. Jason Jones has been a very good pitcher for Trenton the last couple of yrs but IPK,Hughes,Brackman,Betances,Chase Wright,Aceves,Garcia are all ahead of him. The Yankees are stacked with pitching. Zach Groenke was a very good reliever for Trenton last year but once again they have Melancon,Cox,Robertson,Ramirez,Veras,Britton,Albedejo,Sanchez amongst others. Update:It looks like the Cameron for Melky trade is back on, look for that to be finalized tomorrow and also expect Burnett to decide tonight or tommorrow most likely. Brian Cashman the Yankees GM flew from Vegas not home to NY but to Texas to meet with Andy Petitte. Apparently he is going to try and get him to take the 1yr 10 million offer and if not he will move on. It looks like the Yankees could be locking up AJ Burnett also either later on tonight or maybe tomorrow. A rotation of CC,Wang,AJ,Joba,Petitte looks very good to me but i dont know that i would of went after AJ, i would of signed sheets for 2 yrs instead, same risk and probably same high end potential but they do have Hughes to back him up if and when he gets hurt as usual. I hope the Yankees put something in to the contract to have to reach performance bonuses to get all the money. Even with Joba not in the Pen they still have Mo,Marte,Coke,Bruney and i am telling everyone now watch for Mark Melancon this year he could be the next Joba to be groomed as that late inning stopper and maybe successor to MO. The Yankees appeared to have traded Melky for Cameron earlier today but that is being stalled over money, the Yanks want the Brewers to pay some of the 10million he is owed and they dont want to do that, cant blame them after being outbid by the Yankees by 60million on CC. This should get done eventually though. Jon Heyman also reported today that the Yanks are back in on the Tex thing, a lot of people feel that is just to drive the price up on the Sox. I would never count the Yanks out on anything and besides they haven't offered him anything yet and where is Mike Lowell going?? The Nats and O's are the only bidders so far. If i was the Yanks i would offer him 8-176 take it or leave it. The Mets made a lot of noise by getting JJ Putz,Jeremy Reed and reliever Sean Green. Endy Chavez and Heilman are gone as well as 4 minor leaguers. It looks like the Yankees may be close to getting Derek Lowe, if that happens they will drop out on AJ Burnett. I think they may also get sheets then and bring back Petitte. If they have CC,Wang,Lowe,Sheets,Petitte they could put Joba back in the pen also. That could be one of the best rotations and would be the best pen in baseball. The Yankees may be getting Nick Punto to fill the utility role. Kerry Wood appears headed to the Indians. The Cubs are still talking to Peavy but that doesn't look close and nothing new on Texiera. The Mets are trying to get a setup man for Krod but got shot down on Heilman for Street. I think the Mets should get someone for setup and then Ibanez. The Yankees finally got their man. 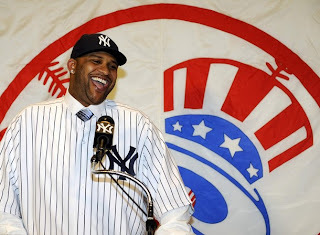 After several weeks of waiting and worrying, CC got a 7 yr deal for 160 million and a opt out clause after 3 years. The yankees now appear to be closing in on Derek Lowe for 4 yrs and 64 million. The Yankees seem to be the only team in on Sheets and may lock him up also for 2 yrs and 26 million. Andy Pettitte will most likely resign and then i expect Joba to be back in the pen. I personally would love to see sheets and then the Yanks go and get Texiera and they will be set, arguably the best team out there. Hopefully we will have more news later on today. New York Yankees GM Brian Cashman blew off his media session today for what was described as a off hotel property situation. It has been confirmed now by Newsday.com as well as Peter Abraham of the Journal News and lohudblogs.com that CC jetted off to California to meet with CC. This seems like a very good sign for the Yanks and hopefully after that he comes back with CC in pinstripes. Remember out on the West Coast it is only going on 8 so i am sure more will be coming out over the next couple of hours as most of us are sleeping, i think i may be keeping an eye on this tonight. Joe Girardi did meet with the Media and was very impressed with his meetings with CC and Ben Sheets who I think is a better risk then AJ Burnett since they can get him on the cheap now and he has the same upside maybe even more so. It looks like the Mets are trying to now land Raul Ibanez which would be another good move for them but I cant help to think no matter what they do if they play in Citifield they will crash and burn sooner or later. If anything breaks i will check back later. CC is still out there waiting it would seem for any California team to make their move. 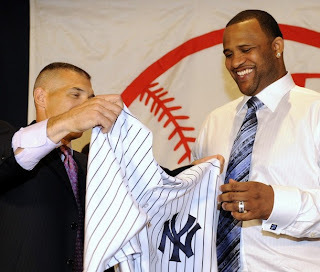 There were unconfirmed reports tonight that turned out to be not true that CC turned down the Yanks offer. Sooner or later though something has to give with him,there is a report that he wont sign by the time the meetings are over on Thursday,that he is meeting with the Giants this weekend. It is time for the Yanks to pull the offer,redo the offer adding more money or give him a deadline. They should sign Sheets who Joe Girardi was very impressed with when they met him and his agent yesterday and it is believed that the Yanks are going to offer 2 yrs 26 million to him if not already done. I would really start talking to Tex if Cash already isn't doing so and not let him get to the Red Sox if possible and of course resign Pett and maybe Lowe or AJ Burnett. The New York Mets have gotten what they needed in landing Mr K-rod for 3 yrs and 37 million. It appears that the Indians are going to sign reliever Kerry Wood and that the Orioles have traded Ramon Hernandez to the Reds for Ryan Freel and minor leaguers Justin Turner and Brandon Waring. If I am the Yankees as crazy as it might seem I think i might have to at least speak with Manny especially if CC goes elsewhere, could you imagine him in Pinstripes going back to Boston or him and Arod back to back, that would be fearsome-or just him and Joe Girardi now that would be an odd pair even more so then him and Torre. It may not be that crazy if CC heads elsewhere. The New York Giants definitely looked distracted as they played a terrible game. They were out of synch on offense all day and just couldn't get anything started. The Eagles stayed alive for now but they need a lot of help. The Giants just basically kept Carolina and Tampa breathing for that 1 seed but its still a long shot unless the Giants totally collapse here which i dont see happening. The Jets well what can I say, they are the Jets and lost on the west coast once again and now find themselves in a three way tie for first with Miami and New England. It wasn't all bad though as the Dallas Cowboys lost in Pittsburgh in a furious rally in the last 7 minutes of the game and therefore the Giants are NFC East champions. It is going to be an interesting final 3 weeks now to see where everyone ends up and who is in or out of the playoffs. Next week the Giants play at Dallas and that will be an interesting game as Dallas will be desperate and the Giants will be angry. The Giants have done a great job of not letting distractions get in their way but this will be the ultimate test. They are at home against the Eagles and should beat them but Antonio Pierce has been dealing with the Plaxico situation all week and we will see how it affects him. I expect the Giants to win but think it will be a very tight game. The Jets should bounce back this week and beat the Niners but they are 0-2 this year on the west coast and dont do well in 4:00 games. I expect the Jets to win but if they do lose the pressure will start mounting. The Cowboys fans are getting all cocky thinking they are going to be like the Giants of last year but they play in Pittsburgh this week where it will be very cold and calling for some snow or at least snow showers, I think they will lose to Pitt and then the Giants will have a chance to finish them off next week. The Patriots are still looming and I expect them to bounce back this week. The Monday night game this week is a big one as Carolina plays Tampa. One of these teams will be in great shape for the 2 seed and still have an outside shot at the 1 seed. Everyone enjoy the games. It looks like we are finally getting somewhere in this rather boring baseball offseason. The Yankees appear to be growing inpatient with not signing anyone yet especially CC. Brian Cashman met with Scott Boras yesterday in Washington D.C. and a suprise guest at the request of Boras was there with him, it was Big Tex, man would of I loved to be a fly on the wall,this was first reported by the NY times and on mlb.com. I like the sound of that but we shall see what happens. Cashman is planning on meeting with CC next in Vegas ahead of the meetings, i think i would offer him free food at the restaurant of his choice in the city. I am glad the Yankees are getting more aggressive and I hope they get him by the end of the weekend. I did hear today that that a friend of CC said there are 2 other mystery teams that have bid, but i dont believe that for one second, the Giants GM said they aren't going too, the Angels said they are focused on Tex and the Dodgers on Manny, I think that is just trying to get the Yanks nervous. I also hear today according to Jayson Starks blog on ESPN that there is increasing buzz about the Yanks signing sheets. I believe that the Braves will get Burnett by the end of the weekend or next week with there 4 yr offer with a 5th yr incentive option but will go 5 yrs if they have too. I expect to be blogging a lot this weekend and next week regarding the Winter Meetings and hopefully good news out of the Bronx. Sean Avery has been suspended 6 games for an offhand comment. I agree that he should be reprimanded and if the team deems they were going to suspend him, thats up to them but for the league to go out and suspend someone for 6 games for a comment he made is just not right. I know he is a little nuts and loves the spotlight, but he was making a joke and looking for attention, he didn't mean any harm by it and personally i dont know that it was so bad. What did he say you ask well he said that other players like his "sloppy seconds" a reference to other players dating his ex gfs. I just cant imagine getting in trouble for saying something like that but its the world we live in now i guess. The New York Rangers beat the Pittsburgh Penguins tonight in a shootout 3-2. They are 6-1 in shootouts this year and it seems like every game is a shootout. The last 3 I believe have been. The Rangers continue to lead the division and also they are at or near the top in the conference. It is good to see the Rangers good again, but lets see what happens, they have to get better at finishing games, in the playoffs there are no shootouts. I believe though with King Henrik and some better chemistry by the end of the year they can make a run in the playoffs. Stephon Marbury was supposed to show up at practice yesterday and he did but was half an hour late and then the meeting with team officials only lasted 15 minutes. This situation is still not resolved and he was told to stay away from the team. Of course he has been ripping the organization and his teamates and as bad as he is, the Knicks look terrible once again. I am sure they will find a way to trade him in the near future or whatever they have to do, but he just needs to be out of their hands. The Knicks are hanging in there and playing ok basketball, at least they are more exciting on the court, and i am sure once this soap opera is over it will make them a better team, more focused. I am really tired of these rich spoiled athletes though and wonder what can be done about these guys? The Giants did the right thing by putting him on the non football injury list and suspending and fining him. Plaxico Buress will not play again this year and who knows if he will ever play again for the Giants. The Giants have been proving over and over again over the last couple of years that they are a team and they can get by losing players that are great players but do harm to the team. As great as a player as Tiki was we later learned how toxic he was to the team and especially Eli Manning and then of course we had Shockey who ironically once he went down the Giants went on their run to the Super Bowl Title and then ended up trading him and of course now Plaxico. The Giants dont have to worry about answering about Plaxico now and can go on and take care of business. If Antonio Pierce gets dragged into this more it could hurt, but as long as he cooperates I dont expect anything to happen there, the Giants should clinch the division this week at home against the Eagles and almost lock up that 1 seed and get ready for a second round matchup in the cold at Giants Stadium. The Giants should be applauded for this decision and how they have deal with problem players lately and for the foundation they have in place. Time for Hixon to keep on doing his thing and maybe Sinorice Moss to get more of a chance or the rookie Mario Manningham. The New York Yankees have decided to not offer arbitration to any of their free agents. I think this is a bit of a shock, i thought for sure they would offer Abreu and Giambi arbitration, but I think maybe they are fearful of the market not being there with the economy in the sewer and that they would just take the money for 1 year and try to reestablish their market for next year. I am also thinking that this says to me, the Yanks are going to spend money to try and get Tex as well as Sabathia and burnett if they have too or if he comes down in price maybe they would still go after him. I wouldn't be upset though if they just ended up signing only CC and Tex. I saw that the Brewers offered CC and Sheets arbitration, now CC isnt going back to them but I could see Sheets doing that as there doesn't appear to be a market for him. Also the Jays offered Burnett arbitration, i guess there is a chance he goes back there but he has enough of a market i am sure he will end up somewhere else. I hope the hotstove will really start to get going now that the holiday is over and the winter meetings begin next week. The Giants have for years looked the other way but I think this is finally going to be the end of the line. I would think his Giants career is over and maybe his NFL career but we will see. The Giants will miss him at some point but without him they spread it around to everyone and they can win without him, Eli 3 best games are the 3 Plax has missed. It doesn't look like Pierce will be in trouble and that is a good thing, i dont think they can live without him, he is the defensive captain and very very good at what he does. We shall see what happens, and we will learn in Jan if they will miss him, this team though I really believe is one of the most focused i have ever seen, nothing fazes them, and it seems with adversity they just get better, i dont think anything can take them away from their goal, repeating. The Giants rolled on with their business and have basically wrapped everything up. I know if Dallas wins the last 4 and the Giants lose all of them then Dallas will win the division but that is not going to happen and as for the 1 seed they are 2 up and tampa and Carolina have to play each other. The Jets well they got a little dose of reality and took a beating by Denver, i had a feeling they were going to lose this game, but with the Patriots loss, are still in good shape for winning the division but now they are out of the 2 seed which is important, they should win at least 3 more if not all 4 so they could still get that seed but we will see. As for the whole Plaxico thing, its not good at all, i dont understand why you would carry a gun into a nightclub and I dont know what role Pierce plays in this whole thing, it seems he is innocent and just trying to do the right thing, but if somehow he is suspended the Giants could be in trouble, they will live without Plaxico but not without Pierce the defensive Captain. Dallas right now is on the outside looking in but it should be a good fight to the finish, dallas plays Pitt,Giants,Ravens and Eagles so i would still say they probably wont make the playoffs but lets see, they have all the talent in the world. Indy keeps winning, ugly but they are 8-4 and a dangerous team. Everyone has been talking about Jets Giants but what about the all Manning bowl, you never know. Stephon Marbury has been suspended for 1 game by the Knicks and told to stay away to at least monday. It doesnt look like he will be on the team too much longer. I knew the Detroit Lions were bad but, wow seeing them on TV, they are really really bad, i think some college teams may be able to beat them. The last 2 weeks the Arizona Cardinals were beat at home by the Giants and now punished in Philly,i guess they aren't for real, just a product of a bad division. The Dallas Cowboys, sure they looked good again yesterday but before all the boys fans get too excited they beat up on 2 bad teams that they had to beat and now they play the Steelers,Giants,Ravens and Eagles, so they still have a long way to go before they even make the playoffs, if they do get in then i think they may be the team that has the best shot at taking down the Giants, but lets see how these last 4 weeks go first. If I were the Yankees I would of been at the Sabathias house eating Thanksgiving dinner with him and his family yesterday, i think thats a good time to get into his good graces, with lots of good food. Everyone enjoy the rest of the holiday weekend. Happy Thanksgiving to all, the football games aren't too attractive for turkey day but it is a tradition. I am not so sure the Detroit Lions are going to win a game this year, and after the Titans got trounced by the Jets it looks like this will be a blowout. All the Giants fans will be interested in the Cowboys and Seahawks, but Seattle having to travel to Dallas doesn't look too good for a team that isn't so good. The night game is a fascinating game to me with the Cards traveling to Philly, of course we also have the subplot of Donovan Mcnabb. I think this is the end for him and his coach Andy Reid. Did anyone see the Knicks last night? It is nice to dream and we all would love to see Lebron but do you think that showing by the Knicks made a good impression on him, i dont think so. In the world of baseball this should make us all feel warm and happy as winter approaches, the New York Yankees pitchers and catchers will be reporting on February 13 and the first game is February 25, the earliest start in 60 years. The Yankees will be playing 33 grapefruit league games. Lets not forget also that the Cubs will be in the new stadium for 2 exhibtion games to finish it off before the real season begins. Will CC be reporting to Tampa, who knows, i for one am a little skeptical of the Angels offer, if they were really going to do it, wouldn't it of happened already?? Do we really think also if they do get somewhat close that the Yanks wont go to 7-160. I would bet on him still being a Yankee in the near future. As for the Mets well it looks like they are about to offer Fuentes and K-rod contracts, they really should just lock up K-rod and move on but they may want both or one and then another guy like Huston Street for the 8th inning, good thinking by them, because that pen is a mess and remember Heilman is going to be traded since they wont make him a starter. I dont think there is much else going on in the baseball world, oh did anyone notice the Pirates signing 2 Indian pitchers and I mean from India not the Cleveland Indians. I dont know how much posting i will be doing the next couple of days, everyone enjoy the holiday and if anything major breaks i am sure i will write about it, otherwise have a happy and healthy one. Isn't it interesting that the Mets name their new stadium Citi Field and now the company is collapsing? Is it possible that CC could visit Lebron tonight in NY and maybe get a tour and talk to the yanks? We all know the problems the NFL had with the Pittsburgh game last week, but every week the officiating is just atrocious,if this was baseball everyone would be going nuts why not the NFL. It makes you think when most of us are struggling to make ends meet, and a guy like CC Sabathia can sit on 140million and not jump at it, doesn't seem fair to me. I know the fans all want Lebron,but is it really ok to basically throw away the next 2 yrs to hope you land Lebron when its no guarantee? Why in the NY papers today do we see matchups of the Jets and Giants,dont you think those teams have to worry about other teams? There is a long way to go before the Super Bowl,seems a lil premature to me, but i guess they have to sell papers. If the Angels are really jumping in on CC, I think the Yanks need to make a bold move of their own and jump in on Tex and see what happens. If the Yankees fail on CC, and dont get Burnett or Lowe or only land one, looks like we will be seeing more of Phil Hughes after all, did everyone forget about him? The NY Rangers are tied for 1st in the conference with the Boston Bruins, can we be having another NY/Boston war in another sport. We always have the Sox and Yanks, and we had the Pats and Giants in the Super Bowl, maybe we will have this battle all hockey season. I heard today that the Red Sox have offered a 1 yr deal to their Captain Jason Varitek but then Scott Boras denied it. Japanese pitcher Tazawa got 4 bids,one of them being the Red Sox but the Rangers are believed to be the high bidder on him. Sweeny Murti of WFAN is reporting that Edgar Renteria has signed a 2 yr deal with the San Francisco Giants, no confirmation on that yet. AJ Burnett is saying today that he will not sign a deal until CC does, so i have to wonder what if CC says he wont sign until AJ does and then they just both dont get signed, you got to love it. Mark Texiera says he wants a new team before xmas, so if im the Yankees i would offer 8-176 and hope that CC gets the hint that they are not going to wait around for him, and maybe they will get their first baseman also and then move swisher to the OF and trade Damon or Matsui. In Anaheim they are not confident at all in Tex coming back to them, the papers out there are saying he would of signed already if he had any intention of coming back. I am not sure but will Dodgers pitcher Chad Billingsly injury affect their pursuit of free agents maybe going after CC, i dont know but that could be interesting. Ok I have to admit it, the Jets finally impressed me. What a win in beating the previously unbeaten Titans in Tennesee. I am sure this week the talk of the Jets/Giants Super Bowl will start heating up again, as for me I prefer to just say they will both be in the playoffs and lets see what happens from there. The Giants just continue to roll along, not much to say about them. What other team can lose their #1 RB and WR and not miss a beat. What a game for Domenick Hixon who had 260+ all purpose yards. They have been running the ball like crazy for the last few weeks and now today Arizona took away the run and they just threw it all over. I dont know how you can beat them without them beating themselves,this is one amazing run the Giants are on, not only are they 6-0 at home this year, they have now won 15 of their last 16 on the road. Carolina lost today so they have a 2 game lead with 5 to go for the 1 seed, on the Bucs also. I think this should do it for the posts for today,if anything major breaks i will post it otherwise i will be back tomorrow. I dont know why I didn't mention this earlier but I will start with Phil Hughes in the Arizona Fall League. He has just completed the season there with 30IP,21H,2-0 3.00ERA,13BB,38K 198avg against. He was one of the youngest pitchers in this league and I think everyone tends to forget how young he is. The reports are that he was consistently sitting 93-95 withIf his fastball. I have always said this but I really think with him it is a matter of staying healthy,he has the stuff to be a 1 or 2 starter in this league. If you watch the last start of last year he made in Toronto he looked awesome. Juan Miranda and Austin Jackson were also out in Arizona. Miranda batted 301 w 5 homers and 20Rbi,378 OBP in 73At bats. Jackson batted 248,1hr and 18 rbi,298obp,114abs. Humberto Sanchez was also in arizona and really had a miserable time. These are the most prominent guys there. Andrew Brackman was in Hawaii along with Jeremy Bleich. Brackman was 3-4 w a 5.56era,34IP,31H,25BB,36K. Brackman just came off Tommy John so the important thing is for him to be pitching and be healthy. Bleich was the 44th overall pick for the Yanks this past yr out of stanford his numbers were 3-2 1.77ERA,35.2IP,29H,12BB,33K. This was his first pro action and he had a very good time in Hawaii-he is a guy to watch as he may rise through the minors fast. There were some other guys but I think these were the most important. Buster Olney of ESPN.com had an interesting take on the Knicks clearing room for Lebron James and how it could of helped the Yanks in their pursuit of CC,they are close friends and CC went to watch Lebron the other night,wonder if they were talking about playing in NY at the same time? This is interesting,lets hope CC comes by the end of thanksgiving weekend. I know all of us Yankee fans are growing impatient because we just cant see what is so hard about accepting a 6 yr 140+million contract. I am sure CC and his agent are waiting for the Dodgers,Giants,Angels but the truth is I dont think any of them will be bidding. The Dodgers are more worried about Manny, the Giants dont have the money with that terrible Zito contract on their hands and the Angels are concentrating on Tex. I think shortly after thanksgiving CC will realize he is waiting for something that isn't going to happen and take the Yankees offers, lets sure hope so because that should get everything going with the rest of the pitchers and probably Tex. I think Lowe will head back to Boston or maybe to the Mets and I just think unless Burnett comes down to 4 years the Yanks wont sign him and the more I think of it good, they need to just sign Tex after CC, get Pett back for cheaper and then see whats left and think of a 2 yr contract for sheets or something like that. I have been saying since April to just sign CC and Tex and I still feel the same way, they wouldn't be in terrible shape with CC,Wang,Joba,Pett,Hughes and what a infield/lineup with Tex. The Mets well i dont know what they are doing. They should just offer Krod the 4 years, but they are saying they dont want to go past 3 yrs for him or Fuentes and may end up getting a closer in a trade, think JJ Putz. I would rather just spend the money then trade chips and spend money but the Mets are a team that could screw up finding their way out of a paper bag, and that Citi Field deal isn't looking so good now. Look for another name, as Citibank keeps tanking and soon may be out of business. In other news, not much going on Furcal may be heading to the Giants or A's and I haven't heard much else. It should be an interesting game out in the desert for the Big Blue. Arizona has the unbelievable duo of Bolden and Fitzgerald with Kurt Warner who is tearing it up. I would think the best way to stop the Cardinals offense is by limiting its time on the field and the best way to do that is for the Giants to use their run game and control the ball. Brandon Jacobs may not play or may be limited which would hurt them but they still have Ward and Bradshaw so the Giants should be fine. I dont have a real good feel on this game but im thinking Giants 28-24. If the Giants do win keep an eye on Panthers at Falcons, if the Falcons can win the Giants would be 2 games up with 5 to play and would look to be in really good shape for that 1 seed i think they will get anyway. The Jets have an interesting game as they try and upend the Titans for the first time. This isn't as big of a game as was last week against the Pats but if the Jets can win they may have a really good shot at the 2 seed which would get them home field and a bye. I am thinking the Titans will probably win at home 17-14. The Patriots play the Dolphins so for the Jets and their fans if they win its a no lose situation, either way they will gain on someone. Did anyone notice TO has finally opened up his mouth and started to complain about the direction of their offense, no suprise here, the Cowboys have all the talent in the world but are just one big soap opera, i dont think they will make the playoffs although they should win the next 2 games. The New York Knicks made two seperate trades today in what is definitely moves to try and get some cap room for 2010. What is 2010 well that is when Lebron James will be a free agent and the Knicks will be after him. Jamal Crawford was shipped to the Golden State Warriors for Al Harrington and Zach Randolph and Mardy Collins was shipped to the Los Angeles Clippers for Tim Thomas a local legend from Paterson Catholic and Cuttino Mobley. All of the players they recieved todays contracts will expire before the 2010 season when also Dwayne Wade and Chris Bosh will be available but Lebron is the big catch. It is obvious that they are getting past the horrible,forgettable,tortuous reign of Isaih Thomas and getting rid of his players and long term contracts are the first signs other then having a new coach and President. Lets see how this all plays out but the Knicks seem to be headed in the right direction. There are lots of rumors out there but really not much action at all. Word today is that CC will decide on Yanks offer after the thanksgiving weekend. Honestly you hear about teams jumping in but right now its just the Yanks, the Dodgers seem like they are going to focus on Manny, the Angels on Tex, the Giants cant really afford Zito and CC so in the end i expect him to sign probably right after the Thanksgiving weekend sometime, i expected it before but i guess i was wrong. Jon Heyman is reporting that the Angels are going to try and make a quick strike offer to Tex with a deadline much like they did with Torii Hunter last year, stay tuned for that any day now. As for AJ Burnett and Derek Lowe supposedly the Yankees are not close now, they want 5 yrs for AJ and 4 for Lowe. If I am the Yankees i say no thanks sign CC go try and get Tex and then maybe get sheets on a 2 yr 20 million or so deal and they will still be under where they were last year in payroll. I hope once something happens then its like dominoes and it will start to heat up, but right now all we can do is wait. After 18 seasons compiling 270 wins,7 gold gloves and his first 20 win season this year the Moose is officially going to announce his retirement later this week. Ken Rosenthal of foxsports.com is reporting it, it was also on Ch 4 news at 6 with Len Berman and is currently on the Yankees.com website. I personally expected this and wish Moose all the best in his life after baseball. I am sure he will enjoy his family and have fun out there in quiet Montoursville,PA. I have to ask this now,is he a hall of famer? I will put a poll up on this soon. I will miss Moose personally as I loved hearing his post game interviews, just classic stuff and he really was a class act. I am guessing it wont take long now for the Yankees to sign Petitte to a 1 yr-8-10 million contract and then hope CC and Burnett decide to come aboard. This will be a different team next year, no Big G and no Moose or Very good very good Abreu. Good Luck Moose and all the best. I know everyone is getting really anxious especially Yankees fans. There is nothing you can do, CC is not going to take the first offer, do you really think he wouldn't shop around and as far as Tex,Boras is his agent, we know he isn't signing anytime soon, the Yankees can settle the pitching then get involved with him later on. If the Sox are really interested in Tex do you think they wont be in on that, everyone thinks no way but come on now this is the Yankees. AJ Burnett, the Yankees are not going to offer 5 and 80, sources say they wont go past 4 years and now we hear the Sox are involved, is that just to drive the price up on the yankees?? If I am the Yankees I may say fine if it gets to a point of craziness with him, let him go to the Sox, sign Ben Sheets for cheap and then put the money into Tex, I have been saying this for a while, I want TEX and CC, I dont care after that, I really dont think the Yankees will be beat if they get those 2 guys. The infield will be the best in baseball we can trade damon and put swish out there. Rotation of CC,Wang,Joba,Sheets,Pett and Hughes to back up isn't so shabby especially with our bullpen. I really hope im right about the Tex thing and just everyone relax there is nothing we can do, except wait and see how it all turns out. Nick Swisher had a conference call with the beat writers at about 5:00PM. He did say that first base is his best position but he is just so excited and proud to be a part of the greatest team there is. He said he just wants to be part of the puzzle and do whatever they ask of him. He would like to play first for the whole year and see what he can do but they haven't talked to him about anything yet. He hasn't talked to CC yet but would love to have him join him in NY and knows everyone will love him and be really excited if he does sign with the Yankees which i still expect. He mentioned that AJ Burnett has electric stuff and would also be a welcome addition. He sounds like a really cool, fun guy and i am sure we will have fun with him around this year. He loves having that short porch to aim for when he is batting left handed. I found it interesting that they didn't tell him for sure he is the first baseman and also that he is willing to do whatever he has to do. Thanks to Peter Abraham of the Lohud Yankees blog and Journal News for having the information and conference call on his site. As i predicted that little troll that makes his living up in beantown was announced as the AL MVP today. I am suprised that Arod finished so low at 8th but what can you do. I am sure this year in a odd year he will put up huge numbers once again. It was also made official today that Ryan Dempster resigned with the Chicago Cubs for 4 years and 52 million. The Yankees are expected to announce at some point that they made an offer for AJ Burnett,the rumor is for 5 years and 80 million. I will be back later with some updates,Nick Swisher did a conference call with the beat writers today and will be coming up on Mike Francessa shortly. I am suprised that Pujols won it, i thought Howard was a sure thing. I have to say though that the true meaning of MVP doesn't matter if your team is first or last,without Pujols they would be in last and who knows how many more losses. Who do we think will win AL MVP, well i hate to say it but i think Dustin Pedroia will win it. I can't stand to see the Bosox win anything but thats better then them winning the World Series, thanks to the Rays they didn't even get to the Series, thank goodness for that and next year we will take care of them. Well every other year so expect Arod to win the MVP again next year, unless Madonna gets in his way. It has been slow since the Yankees offered CC a record deal, we still haven't heard from him yet. I still expect him to end up in pinstripes, no other team will even come close to what the Yanks are offering. The San Francisco Giants made the first free agent signing of the Hot Stove by signing Jeremy Affeldt to 2 years 8 million. As for the Yankees news the Moose agent Arn Tellem said today in an email that he expects his client to make his decision by the end of this week or early next week. I really dont think at this point it has anything to do with money and i still believe he will retire, yes I know no one does that after having a season like he had but he would have to committ for more then 1 year and Moose has been hinting at retiring all year. Why not go out on top and enjoy his quiet family life out in Montoursville,PA. 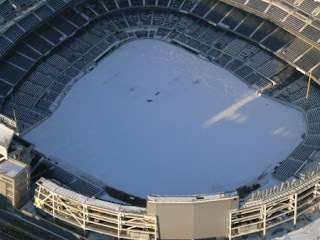 The big news of the day was that the Yankees announced they will be playing a exhibition series against the Chicago Cubs to open the new Yankee Stadium. The games will be played on Friday April 3 at 7:05PM and Saturday April 4 at 1:05PM. Ticket announcements will be made soon so stay tuned, i wonder if i will get them in my season ticket package. The Cubs will be in town for the first time since 2005 when the Yanks played them in interleague. This series will mark the return of Sweet Lou Piniella who patrolled the outfield for 11 seasons and won 2 championships in 1977 and 78. He was also manager of the yankees in 1986-88. One of my favorites Alfonso Soriano will also be back in town, i hated to see him go but of course we got the great Madonna loving Arod for him so cant argue with that. Did anyone notice that he was hanging out with Kate Hudson in Miami now thats more like it Arod, I mean Madonna she is a little weathered dont you think?? I was a little off on my prediction of Giants 24-Ravens 17 but I will take 30-10. Is there anyone who can stop the Giants 3 headed monster? Im not so sure there is, the Ravens had the #1 Ranked rushing D and the Giants ran right over them for 207 yards, there 5 game this year where they have had 200+rushing yards. The Giants seemed really primed to take the 1 seed and have homefield advantage where they are 6-0 this year. Last night in a game that is getting a lot of press today, Pittsburgh won 11-10, first time in the history of the NFL a game has finished with that score. The controversy is in the last play of the game, can the NFL officiating possibly get any worse then it is now?? The last play brings up a lot of conspiracy theories to fans because why would you review that when either way Pitt wins the game, so who cares what the score is of course except for the bettors. Dallas won a big game for them last night to stay alive and they have to win the next 2 weeks with Seattle and San Francisco but we shall see. Giants to get ready for the desert and the high flying Arizona Cardinals.